FAQ's 1. How will I know my order was processed? You will receive an order confirmation email within 24 hours after your order has been submitted. Please allow 24-48 hours for us prepare our proposed layout and send it to you for approval. After which, the payment procedure will be sent to you when you are ready to proceed with the order. Upon layout/design approval and payment confirmation, it usually takes us 7-10 working days to process your order. All our items are handmade. Our craft smiths take pride in what they make. They try to make sure that all the pieces made are of good and excellent condition before they are handed out to our customers. 3. How will I know my order is ready for pick up or has shipped? As soon as your Elena Bautista piece is done, you will receive an advise from our staff. A shipping confirmation email containing a link to track your order from our chosen courier will also be sent to you. Please allow up to 48 hours for your tracking information to update with additional details. You have the following options to pay for your Elena Bautista piece/s: We accept bank cash deposits through BPI and BDO). For US customers, you can course it through Wells Fargo. We request that you send your deposit slip via email for quicker payment confirmation. We accept PayPal payments. Additional charges may apply. 5. Can items be resized or changed in any way? As we take pride in the design, workmanship, and philosophy behind each Elena Bautista piece, all our items are maintained as described. We may consider variations at a later time. 6. Can I submit my own designs or font to be rendered to the items? Currently, we do not accept personal designs or font unless it is a formal collaboration. 7. I've submitted my Order Form but I changed my mind on some/all personalization. Can I still change that? Yes. Production process starts upon layout/design approval and payment confirmation. After which, the layout/design will be considered final. 8. What material/s do you use for all your pieces? We work with brass and silver. We also use real gold (14k) upon request. All our pieces are carefully and intricately handcrafted. They are all custom made for you. 9. How do I care for my Elena Bautista piece/s? Like any accessory in the market, it will eventually fade. But with proper care and maintenance, you can help prolong its shine and luster. It will help to use a tad amount of metal polish to clean the item. We also give one (1) free yellow gold re-plating as an added bonus when you purchase one of our items. 10. What order are the letters in a monogram? Traditional monogrammed initials are ordered, First Name or Given Name initial, Last Name initial, and Middle Name initial. However, this is a truly custom item so you may choose any three letters or order of letters that you wish. 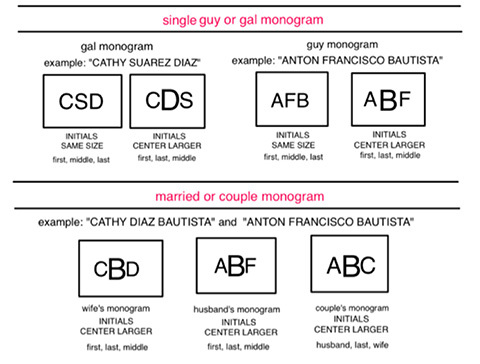 To further guide you on the monogramming rules, we created a chart for your reference.